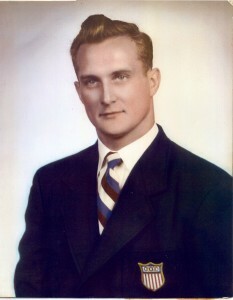 Joe Verdeur was a four-time NCAA All-American swimmer (1946-50) from LaSalle University. Twice named Sport Magazine Swimmer of the Year, Verdeur set 21 American and 19 World records between 1948 and 1950. In 1948, Verdeur was named NCAA “Swimmer of the Year”, and also captured a gold medal in the 200m breaststroke at the Summer Olympic Games in London. Legendary sports writer Grantland Rice called Verdeur “the greatest swimmer of the 1st half century.” Verdeur was a charter inductee into the LaSalle University Hall of Athletics, was inducted into the International Swimming Hall of Fame in 1966, and the Pennsylvania Hall of Fame in 1975. If you were looking for an All-American boy in the 1940s you would have found one in the Philadelphia area. Joe Verdeur was a man’s man. He was one of the greatest American swimmers of the 20th century. Legendary sportswriter Grantland Rice called Verdeur “the greatest swimmer of the first half century”. Verdeur, a graduate of LaSalle University in Philadelphia, set 21 American, 12 NCAA and 19 World records. He was named NCAA Swimmer of the Year in 1948. Twice Sport Magazine named him its Outstanding Swimmer of the Year (’48, ’49). At the ’48 Olympic Games in London Verdeur won the Gold Medal and set an Olympic record (2:39.3) in the 100-meter Breaststroke. He was a charter inductee into the LaSalle University Hall of Athletes and was inducted into the Pennsylvania Hall of Fame (’75) and the International Swimming Hall of Fame (’66). This year the National Polish-American Sports Hall of Fame inducted Verdeur, an honor his wife, Mary Ellen Verdeur, said fulfills a dream he had many years ago. Joe Verdeur died of cancer in ’91 at age 65. His mother was Sophie Verdeur and her maiden name was Machalowski. She was born in Poland in a town called Mlawa located just outside of Warsaw. His life as a swimmer was but one aspect of Verdeur’s time on earth. The sport gained him fame if not fortune. People knew Verdeur wherever he went in the Philadelphia area and throughout New Jersey. He had two siblings, a sister, Theresa, and a brother, Edward. Their mother raised them nearly all their lives as their father died when Joe was six-years-old. Sophie Verdeur was a strong woman who was strict with her children. The discipline she demanded played a major role in Joe Verdeur’s life, his career and the way he and Mary Ellen raised their five children. Mary Ellen Verdeur lives in Marlton, N.J., with daughter Michele (Donahue), her husband and their daughter Kelly. Kelly Donahue is one of the Joe and Mary Ellen Verdeur’s 11 grandchildren and Kelly Donahue, like her grandfather, is a teacher. Joe Verdeur went to North Catholic High School for Boys in Philadelphia. It was here that he won his first national (AAU) title. He excelled in the breaststroke and the individual medley, an event that tests four swim strokes – butterfly, backstroke, breaststroke and freestyle). Many tabbed him King of the Medley. 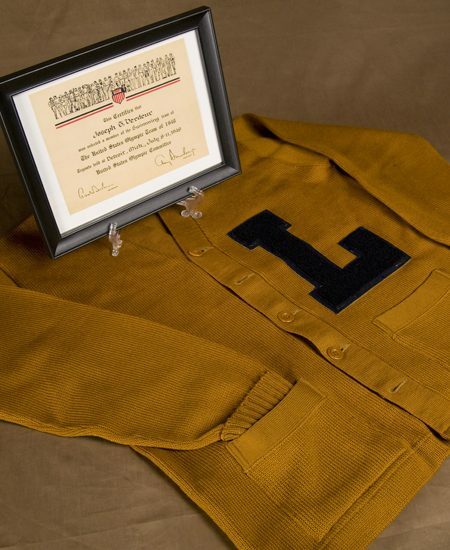 Verdeur then went to LaSalle and later convinced Tom Gola, an inductee into the NPASHF, to attend LaSalle as well. It was there that Verdeur, a four-time NCAA All-American, would set 12 NCAA records and would become a two-time NCAA champion in both the butterfly and individual medley. Beyond Verdeur’s accomplishments in the pool, and in some cases because of it, Verdeur gave back to the sport — nine years as a coach at Temple University and as a teacher for 30 years within the Philadelphia public school system. Later he was a successful businessman and also worked as a building supervisor for a hospital. The reason Verdeur had so many jobs was obvious. He had a large family to support. And above all else Verdeur was a family man. His daughter, Michele Donahue, remembers her father taking the family to the Jersey shore on hot summer days. Verdeur was there for school activities. If he didn’t take his children, Mary Ellen did. They found a way to show their support as best they could with what they had. Of their children, only Joe, Jr., competed in swimming. He attended Archbishop Carroll High if Radnor, Pa., and later competed in college at Philadelphia College of Textile and Science (later changed to Philadelphia University). Joe, Jr., lives in Havertown, Pa., near Philadelphia. He and his wife have two children, Joe III and Matthew. “He’d take me everywhere,” Joe said of his then-famous father. “We go to swim meets, Temple football games. I was like a mascot. Everybody knew him. It was quite impressive. I knew what he accomplished but I was just 11, 12, 13-years-old at the time. I didn’t understand it. “I enjoyed swimming. My dad said I was better than average. I did OK. 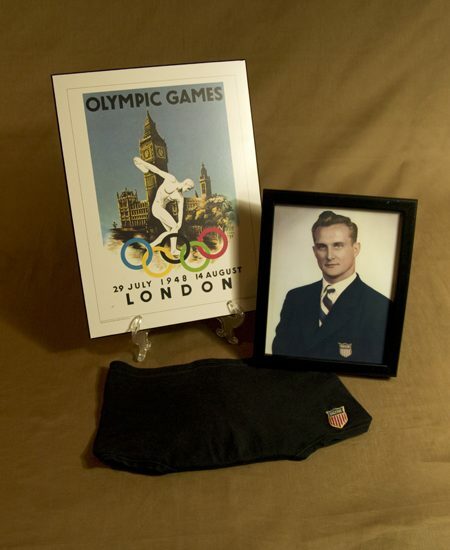 When Verdeur died, Mary Ellen gave each of their children the memorabilia they had collected over the years, and Joe, Jr., is very proud of the collection in his home. So we welcome Joe Verdeur into the National Polish-American Sports Hall of Fame. Mary Ellen would like everyone to remember him as a good guy who would talk to anyone he met and make them feel like his best friend. “And he was cute,” Mary Ellen said. Joe Verdeur was a handsome man indeed.